A new study reveals that dark chocolate with a high percentage of cocoa benefits mood. Cocoa benefits root to compounds called polyphenols that have been shown to positively affect anxiety and enhance calmness. Even those of us who don’t have clinical depression or anxiety could use a little mood boost. Wouldn’t it be great if we could feel more calm and content by regularly consuming something as delicious and satisfying as chocolate? A new study reveals that dark chocolate with a high percentage of cocoa benefits mood. The impressive results from the first clinical study to show that dark chocolate containing a high content of cocoa benefits mood were reported in 2013 in Journal of Psychopharmacology. Noting that cocoa contains compounds called polyphenols that have been shown to positively affect anxiety and enhance calmness, researchers from the Center for Human Psychopharmacology at Swinburne University in Melbourne, Australia, examined the effects of a dark chocolate drink on mood in healthy, middle-aged adults. The effects of chocolate drinks containing both high and low doses of cocoa polyphenols were examined in a randomized, double-blind, placebo-controlled study. The 72 participants, who were free from age-related diseases such as dementia and cardiovascular disease, were randomly assigned to receive a dark chocolate drink mix containing either 500 mg (high dose), 250 mg (low dose), or 0 mg (placebo) of cocoa polyphenols once daily for 30 days. The high-dose drink mix contained Acticoa cocoa powder made by Callebaut, the study’s funder. The drink mixes were identical in taste and calories and differed only in polyphenol content. Potential cocoa benefits on different aspects of mood, memory, and attention were measured at baseline, after a single serving of the chocolate drink mix, and after 30 days of consumption. After one dose of the chocolate drink mix, there were no cocoa benefits for any measure of mood or cognitive function. However, after 30 days of cocoa consumption, there were significant improvements on certain aspects of mood, including calmness and contentedness. The positive cocoa benefits on mood were statistically significant for the high-polyphenol group but not for the low-polyphenol or placebo groups. The self-rated calmness and contentedness were significantly increased in those subjects drinking the high-dose polyphenol dark chocolate drink compared to those drinking the placebo. None of the treatments had any significant effects on any of the cognitive factor scores (measures of memory and attention) after 30 days. Other studies, however, have shown that consumption of dark chocolate or cocoa benefits memory, attention, and other aspects of cognitive performance in older adults with mild cognitive impairment. In the study cited here, however, healthy adults without pre-existing cognitive impairment did not seem to benefit in terms of cognitive function. 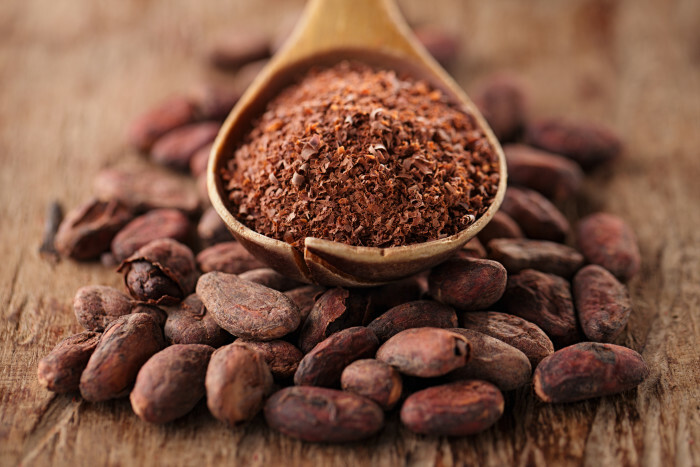 The authors also noted that the results provide “a rationale for exploring whether cocoa polyphenols can ameliorate the symptoms associated with clinical anxiety or depression.” Such studies are likely to be performed in the near future. For now, however, we know that, at least in people without clinical depression or anxiety, a small daily dose of dark chocolate or cocoa benefits mood. Over 10 percent of the weight of cocoa powder is flavonoids, a group of polyphenolic compounds that occur widely in fruits, vegetables, tea, red wine, and chocolate. Cocoa and chocolate products have the highest concentration of flavonoids among commonly consumed foods. And dark chocolate is one of the richest sources of polyphenols. A small portion of dark chocolate (40 grams or about 1 and 1/2 ounces) contains 400-800 mg of polyphenols, while 10 grams of cocoa powder contains about 600 mg. Milk chocolate has significantly less polyphenols, while white chocolate has none. You don’t need to purchase a special high-flavonoid or high-polyphenol chocolate like the chocolate used in this study in order to get a high concentration of these mood-boosting compounds. The darker the chocolate, the higher the percentage of cocoa it contains, and the more polyphenols you’ll consume per serving. When choosing a chocolate or cocoa product, look for one that is at least 70 percent cocoa or even darker (for instance, 85 percent cocoa) if you like. Eat one or two ounces per day, no more. Or, another way to measure your limit per day would be to consume no more than 150 calories per day which can be easily determined from the label. Or use about 10 grams per day of non-alkalized cocoa powder. You can mix the cocoa powder with alternative milks and sweeteners for a delicious, high-polyphenol, mood-enhancing, non-dairy, low-sugar beverage. If dark chocolate isn’t your thing, there are plenty of other natural ways to boost your mood. For instance, you can try the herb ashwagandha or the nutrient SAM-e. These natural remedies can also be helpful if you’re suffering from clinical depression or anxiety. However, if your mood issue is serious or chronic, you will want to find the root cause and tackle it with a more comprehensive natural approach. J Psychopharmacol. January 29, 2013.
anxiety, anxiety and depression, anxiety or depression, bacteria, brain, calories, cardiovascular, cardiovascular disease, chocolate, chocolate benefits, clinical anxiety, clinical depression, cocoa benefits, cognitive function, cognitive impairment, cognitive performance, dairy, dementia, depression, depression or anxiety, health, heart health, hypertension, is dark chocolate good for you, ldl, lower ldl, lower ldl naturally, memory, mild cognitive, mild cognitive impairment, milk, mood, natural remedies, polyphenols, prediabetes, sugar, vegetables, wine. Nearly three weeks ago, I quit eating all sugar, but I’m not ready to give up chocolate. I found a new favorite treat: I put a scoop of cacao powder into my coffee and then sweeten it with liquid stevia. It’s delicious and satisfies my chocolate cravings. This is NOT a new study. The study linked to was published in 2013. Come on UHN Daily, whatever happened to peer review of your articles before publishing them. Please correct this.